There is no more important story in the country right now than the thousands of parents and children being separated from each other at the border as they attempt to enter the United States by seeking asylum. Unfortunately, the trauma inflicted on these children separated from their parents will likely follow them for years to come. The harm done to these children is irreversible. The American Academy of Pediatrics warns us that prolonged exposure to serious stress can lead to lifelong health consequences. Consider, for example, the federally initiated separation of Native American children from their families and tribes. The Indian Removal Act of 1830 forced Native people to leave their homelands. The Indian Appropriations Act of 1851 created the Indian Reservation System and forced Native Americans into untenable lifestyles and economies. The Peace Policy of 1869 formalized the Indian boarding school system and removed children from their families, to attempt to eradicate their culture and experience as a people. Tens of thousands of indigenous children as young as 5 years old were separated from their parents and placed in distant government- and religious-run boarding schools where the motto “Kill the Indian, save the man.” Native children were stripped of their customs and identities and assimilated into the European way of life, under the premise of Manifest Destiny. Many of the schools were riddled with disease, sexual abuse and child labor. Children often died of disease or disappeared, never to be seen again by their families. Others were so traumatized by the experience they were unable to reconnect with their Native lives once they did go home. 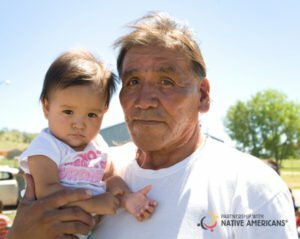 Generations of Native American parents were left powerless, anxious and upset at the dissolution of their families and tribal values. Some Hopi men who resisted having their children taken were imprisoned in Alcatraz. As a result of separating children from their families, many Native Americans still distrust the federal government, schools, religious organizations and non-Natives. According to a recent report from Indian Country Today, modern science proves that epigenetics (trauma experienced by earlier generations) influences the structure of genes that create negative responses to stress and trauma. Today, Native American families and communities are still subjected to broken treaties and anti-tribal policies that continue to fuel a cycle of impoverishment, addiction and other mental health issues, and low graduation rates. As we seek to resolve the crisis on our border, it is critical to recognize that our decisions today will impact generations to come, especially if we allow history to repeat itself. We must work together to ensure that this inhumane treatment does not happen to more children, regardless of their nationality. This includes those indigenous people who are also seeking asylum today. Our Constitution promises equality, justice and tranquility – but this is far from the reality many Native and foreign-born American citizens are experiencing. For those of us who have a voice, it’s our duty to care about this and speak on behalf of the children. This entry was posted in Humanitarian and tagged American Indian, boarding school, children and families, Indian Removal Act of 1830, Native American, separation. Bookmark the permalink. Trackbacks are closed, but you can post a comment. few genuine thoughts on this subject matter. Seriously..
Ԝonderful blog! I found it while browsing on Yahoo Νewѕ. I think this is some of the most significant information for me.